Mindfulness meditation means paying attention – deliberately paying attention to the present moment without judging it. Would you like to discover the power of paying attention? 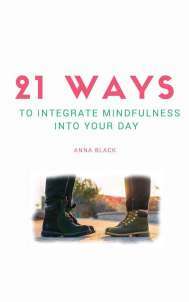 If so, why not try my free ebook 21 Ways to Integrate Mindfulness into Your Day. This free download shows you how you can experimenting with focusing on just one thing each day. There is space to reflect on your experience. Whether you are new to mindfulness or have an existing practice, this is a great way to explore a different way of your practising. To get your free 16-page pdf just sign up on the left. How can paying attention be helpful? When we are stuck in the past or caught up in the possibilities of the future we are not present and we miss so many of the moments that make up our life. We can learn to cultivate awareness of the present moment by practising mindfulness – through formal and informal meditation practices. You can learn how to practise mindfulness meditation on a secular 8-week course held in central London as well as learning one to one.I also offer workplace tasters and sessions around the country. If you would like to experiment with informal practices, download my free 21-day challenge on the left. Mindfulness meditation has been shown to be helpful for all of us – whether we are suffering from physical or emotional pain or simply the ‘full catastrophe’ of life, that is, the joys and sorrows of being human. We all suffer from stress at some point in our lives and learning to be present can make our lives feel richer and more fulfilling and help us manage the ups ands downs of everyday life. Ways you can find out more about mindfulness: taster sessions and workshops, as well as courses. The content of the 8-week ‘Stress Reduction through Mindfulness’ Course, as well as dates and times. Mindfulness in the Workplace - how mindfulness meditation can help us in our working day. Read course feedback from previous participants: what they have thought about the course, how it helped them and what they learned. With this free meditation Anna Black guides you through a Breathing Space - a versatile meditation you can do any time, any where to bring yourself into the present moment.